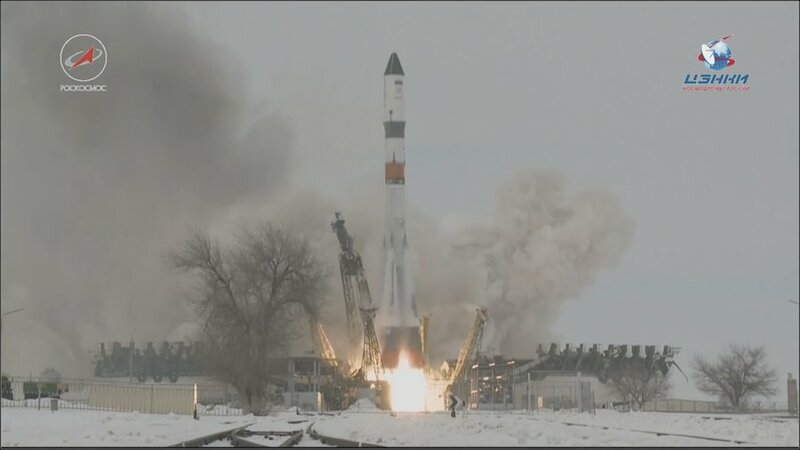 The Progress MS-08 supply ship blasted off atop a Soyuz-2.1a rocket at 0813:33 GMT (3:13:33 a.m. EST; 2:13:33 p.m. Baikonur time) Tuesday from the historic Russian-run spaceport on the steppe of Kazakhstan. 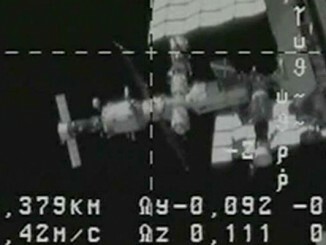 Docking with the International Space Station’s Zvezda service module is scheduled for 1043 GMT (5:43 a.m. EST) Thursday. The robotic cargo capsule is packed with 3,064 pounds (1,390 kilograms) of equipment, scientific hardware, food and supplies for the orbiting lab’s six-person crew, plus 1,962 pounds (890 kilograms) of propellant for the station, plus 926 pounds (420 kilograms) of water, 53 pounds (24 kilograms) of compressed air and 48 pounds (22 kilograms) of compressed oxygen. A launch attempt Sunday was halted with less than one minute remaining in the countdown. 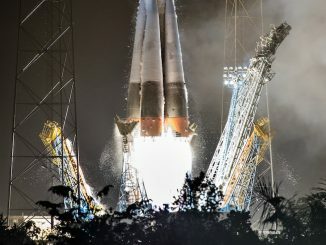 Russian officials have not officially disclosed a reason for the last-minute abort — the second in a row for a Progress resupply launch — but the website RussianSpaceWeb.com, which reports on Russia’s space program, said a component of the Soyuz flight control system was replaced after Sunday’s scrub. The aborted countdown Sunday thwarted plans to send the Progress MS-08 freighter on an expedited three-and-a-half hour approach to the space station. An abbreviated rendezvous requires the space station to be nearly directly overhead the Baikonur Cosmodrome at the time of launch, an orbital alignment that is not available Tuesday. Instead, the Progress will take a more leisurely two-day flight to the research complex orbiting more than 250 miles (400 kilometers) above Earth. At the time of launch, the space station was flying over the South Atlantic Ocean to the north of the Falkland Islands. The delay in the Progress MS-08 supply ship’s launch and docking forced space station officials to push back a spacewalk by astronauts Mark Vande Hei and Norishige Kanai from Thursday to Friday. The Soyuz-2.1a rocket’s four strap-on boosters and core engine, all fueled by a mix of kerosene and liquid oxygen, sent the Progress MS-08 cargo craft away from snow-covered Launch Pad No. 31 at the Baikonur Cosmodrome. The four booster engines shut down and dropped away at T+plus 1 minute, 58 seconds, and the core stage — also called the second stage — is fired until nearly T+plus 5 minutes. The aerodynamic shroud covering the Progress MS-08 supply ship fell away from the rocket at T+plus 3 minutes, 3 seconds. The third stage’s RD-0110 engine ignited and sent the Progress MS-08 spacecraft into orbit. Third stage shutdown occurred at T+plus 8 minutes, 45 seconds, followed by separation of the Progress supply ship. The robotic resupply vehicle unfurled its power-generating solar arrays and navigation antennas moments after deployment from the Soyuz upper stage, kicking off a series of thruster firings and approach maneuvers leading up to Thursday’s radar-guided link-up with the space station. Among the experiments stowed inside the Progress MS-08 spacecraft’s pressurized compartment is an antenna package to track the movements of small animals across the globe. Called Icarus, the project aims to reveal changes in migratory routes, animal connections and other animal behavior. The antenna carried aloft Tuesday will be installed outside the space station on a spacewalk later this year, and a computer launched on a Russian Progress mission in October will help process the signals coming from tracking units tagged to animals on Earth. The Progress freighter also carries experimental radiators mounted on the ship’s exterior. 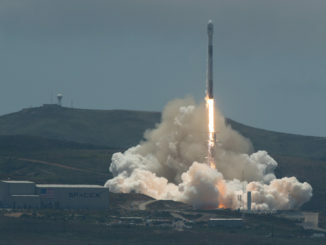 The devices will help engineers test the performance of a new thermal control system that could be used on future space missions, according to RussianSpaceWeb.com.